An enchanting new destination combined with a luxurious Aegean yacht charter experience create the special vacation everybody desires. Completely decompress on board of a luxurious yacht while indulging in the delicious dishes and exquisite champagne offered on board. Let the reinvigorating breeze caress your tanned skin and adventure into discovering the plethora of surprises hidden in every corner of the Greek paradise. With a multitude of serene beaches, breathtaking islands, crystal-clear waters, historical landmarks, and remarkable landscapes, Greece is undoubtedly one of the most irresistible European destinations. And discovering its beauty while on board a lavish Aegean yacht can only enhance your experience. So, hop on board, enjoy the freedom, privacy, and luxury offered by your yachting escapade and prepare yourself to be mesmerized by Athens and the delightful Saronic Islands. With a perfect combination of serenity and bustle, Athens is a place you will never forget. The Greek capital is a buzzing city filled with energized locals and curious travelers, but the laid-back atmosphere is easy to be observed. Greeks are known for their positivity as they are famous for their spectacular mythology and history. Strolling the beautifully arranged streets of Athens will give you the chance to get closer to its fantastic past, understand its intriguing present, and catch a glimpse of Athenians’ possible future. Wander around without a map, observing the charming little alleys, the old buildings, and the restlessness of people. Stop in one of the inviting restaurants and taverns and enjoy an encounter with the famous Greek cuisine. Then, let the ancient ruins amaze your eyes. 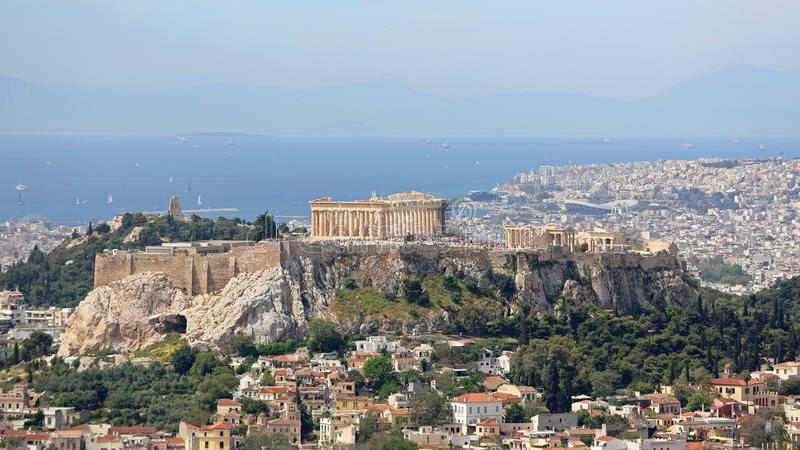 Visit the imposing Acropolis, catching sight of the fascinating Greek heritage. The magnificent ruins are visible from almost every corner of Athens, but standing right next to them will give you a memorable feeling. Then, continue traveling back in time and visit the magnificent Temple of Athena Nike, the inspiring Roman Agora, and the oldest theatre in the country, Theatre of Dionysus- a place where many famous Greek comedies and tragedies debuted. Your history encounter can go on for a long time, as there is an impressive number of monuments, ruins, and museums in Athens. However, you can continue your visit experiencing authentic Greek culture exploring Plaka. Wander around this delightful area, admire the captivating architecture, and stop at one of the many inviting terraces to pay respect to Dionysus and luxuriate in a glass of the tasty local wine. In addition to a rich history and a fabulous culture, Athens also offers visitors the chance to have unforgettable culinary experiences. Stifado, a tasty stew with lamb, octopus, or rabbit, the famous fried cheese called Saganaki, and the lasagna-like dish known as Pastitsio are only some of the delicious Greek dishes you should try when visiting Athens. To properly taste your way around Greece, having Greek yoghurt is a must. Prepare to feel like a pampered god! And before you hop on your luxurious yacht to visit the beautiful Greek islands, experience Athens’ explosive nightlife. Whether you prefer dancing in one of the famous clubs or browsing the buzzing streets of the old centre in search for a quirky terrace, Athens promises you a fantastic nightlife, in addition to the easygoing atmosphere that surrounds the city during the day. Lying to the south of the beautiful Greek capital, the Saronic Islands are a paradisiacal destination for all nature lovers. However, with their rich past, chartering a luxury yacht around these wonderlands is also a thrilling idea for history aficionados. 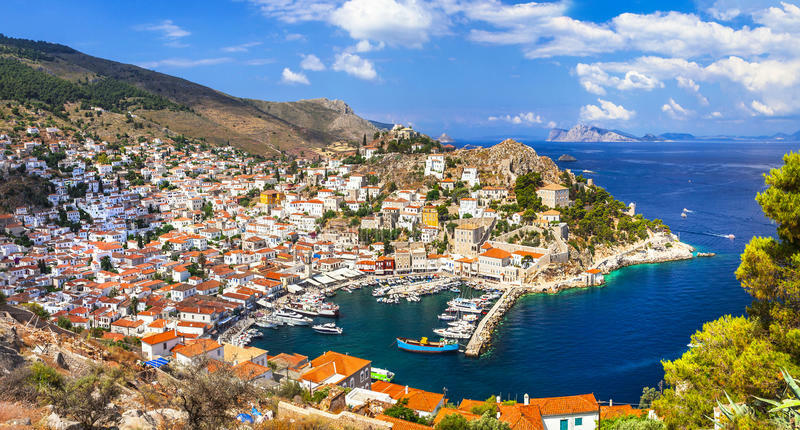 Relax on the deck of your yacht while luxuriating in a cold glass of Champagne and a tasty dish, and get ready to explore these idyllic Greek islands. Aegina is a fantastic place for people who want to enlarge their knowledge and learn about the captivating past of this island. The Temple of Aphaia is undoubtedly the island’s star, but history enthusiasts have a plethora of interesting sights to discover. In the meantime, visitors who want to relax and feel the laid-back atmosphere can enjoy the diversity of beaches available. Whether you want to unwind on a secluded beach or you prefer being in the middle of the action, sipping tasty cocktails and listening to good music, Aegina offers you everything your heart desires. If you are tired of the big city life and want to completely decompress, charming Hydra is your answer. Famous for being a small paradise free of wheeled vehicles, Hydra is the perfect spot for romantics who don’t want to be disturbed by engine noises during their escapade. Stroll the delightful paths of the island admiring the beautiful stone architecture, swim in the crystal-clear waters, and enjoy the desired silence. But during the night, Hydra shows visitors a different face. Together with beautiful Spetses Island, this island is famous for its bustling nightlife. So, if you want to hop off your luxurious yacht and attend a memorable party, choose between the port of Hydra and the old port of Spetses. Life on board a lavish yacht is exciting, but if you need an adrenaline rush, hop off and visit Poros, an island renowned for its enchanting landscapes, lively atmosphere, and thrilling watersports. In addition to ancient ruins, peaceful beaches, exciting activities, and its natural beauty, the Saronic Islands, like all of Greece, are famous for their spectacular cuisine. Therefore, indulge in the delicious seafood dishes and pair them with tasty local wine to enjoy the complete Greek experience you deserve. These are some of the many incredible things you can see and do in Athens and the Saronic Islands while sailing on board of a private, Aegean yacht charter. Greece has a plethora of idyllic destinations you can choose from, depending on your preferences and requests. When you are ready to offer yourself the decadent vacation you deserve, begin planning the ultimate Aegean yacht charter escape, by contacting World Yacht Group for further information on charter rates and availability.